What is PEth Alcohol Testing? 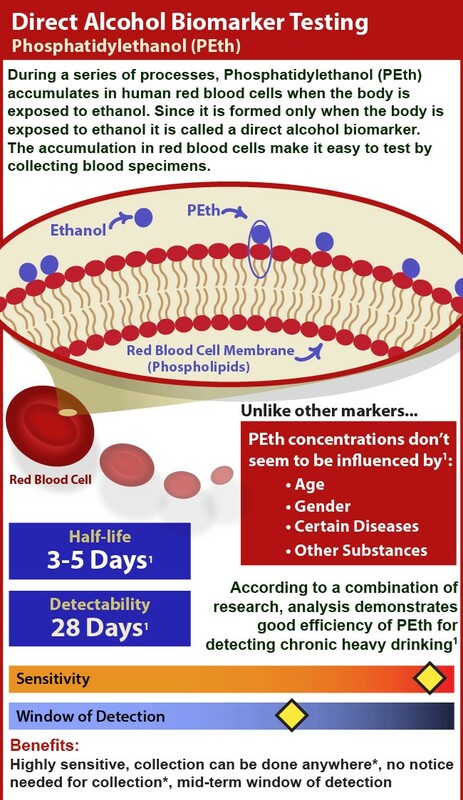 A PEth Test Looks back 3 weeks and looks for direct biomarkers of alcohol that remain in the blood stream for up to 3 weeks after consumption. A peth test detects binge drinking or chronic alcohol use. Testing is often ordered by courts, families, or case workers concerned about a person staying sober over a period of time. When someone consumes alcohol (ethanol), the body creates something called phosphatidylethanol (“peth”). Once the alcohol is gone, peth remains in the bloodstream. Depending on how much was consumed, this metabolite stays in the blood for about 3 weeks. The more that is consumed, the longer it can be detected. Peth tests do not pick up light or casual drinking; if someone has had a couple drinks on a few occasions in the past few weeks, the Peth test will most likely come back negative. It should also be noted that body weight, metabolism, the number of drinks, and the severity of the binges all affect how long Peth can be detected. In some cases, it can last as long as 4 weeks. Peth tests take a little bit longer to get back results than typical drug tests. We will send you your results by email, once they are ready. Results will simply indicate “positive” or “negative”. We can usually get results back within 5 business days, however, if the screen is non negative, the specimen will be put into confirmation, which can take a few extra days.